So true. Those “equal opportunity” hours are made up of minutes. Lots of them. I’ve noticed the minutes are made up of something, too. Sure, they’re called seconds and marked by the really fast hand on the clock, but that’s not what I’m getting at. The measure of my too-full minutes is in places and people. I feel the grind of moving from place to place on a busy, all-over-the-map day; the here-there-and-everywhere of my schedule can be wearying. I can take it in stride most of the time, but I know I’ll be exhausted by the end. One thing I do like is that inanimate buildings or locations are never offended by my single-track, task focus and “get in, get out” attitude. The people are different. I seem to be hard-wired with that “task orientation” focus. To do something for someone can be easier than to be with someone. At its best, focus yields high productivity; and at its worst, people feel steam-rolled. Not good. The other side of that pendulum swing is being present with people to the point of warped empathic connection. Some of their “stuff” gets on me when I’m sitting with them in it, and I can’t seem to keep realistic emotional boundaries. (I’ve really grown in some of this, thankfully!) All this to say, relational connection is hard. I want to be with people, and I want to share the good, bad, and really ugly with those who need it. I want it because I know I need that myself. Relationships can be sweet and difficult, simultaneously, can’t they? I want to begin to see the people around me as a unique, precious, “in the moment” opportunity. Right now, I’m missing that mark pretty often, and that’s why I think I called this post “Rucksack Full o’ Rocks.” I’m nudged hard to notice the weight of the influence my typical patterns create in others’ lives. It’s heavy knowing I am going into an area of weakness, and I got nothin’. I’m also keenly aware of the weight of relationship. If I know anything, I know going into unfamiliar territory or places I’ve lost ground before requires a plan. I’m not usually one to go into anything without a plan (even if it’s my own, prideful one). No plan? Okay, I just won’t go. That’s not going to fly here. If I’m going in, I’m going to be as wise, practical, and biblical as I can. Here are some things I want to begin to think seriously about. We’re back to my word for the year, breathe, and it really makes sense here. I don’t need to go into relationships willy-nilly. At break-neck pace, I never actually step outside myself, and I don’t see a single person around me. I definitely bring more chaos than care into the moment, and I’m not listening for the whisper of direction when it’s there. A good way to miss the unique quality in a moment is to speed right through it. This one’s a real challenge! The enemy of being present with someone is really found inside of me. When I’m focused on an electronic device, a task, or formulating the perfect response as I’m “listening,” I am not genuinely being with the person in front of me. Jan Johnson wrote a great book I recommend when it comes to this topic. Hidden within the pages of Invitation to the Jesus Life is beautiful wisdom on really being with people. Christ was. I want to be. This is tricky for two reasons. Relationship is about being with others in proximity and in empathy, love, encouragement (you get the idea). Focused attention and actively listening are two pieces of that puzzle I know I want to do well, and I’ve grown in them over the years. That makes me happy. Knowing how to empathize has taken time, and I’m still learning. At least I’m on that road. Taking on others’ “stuff” emotionally as my own is not what healthy relationship looks like. Letting others’ hard situations monopolize my mind, time, or resources definitely isn’t it. And, sometimes love looks like inaction when you’re really choosing not to enable. Whew! Messy stuff, right? I love the tension in Scripture! The first three examples remind me that people are likely to provoke me, possibly intentionally, in their struggles. The James 2 verses are my reminder that, when it comes to practical needs and follow-through, I have responsibility. Truthfully, some may throw their heavy rocks at me, or I might be tempted to hold them for them. Needs are tricky. This can be the fun part of the whole thing. Genesis 16:13 introduces God’s name, El Ro’i, the One who sees. We feel “seen” when one of God’s people notices us, don’t we? It’s a beautiful opportunity any of us can take…. Once I’ve slowed down, given my full attention, and identified the opportunity as a moment to participate in what God is doing, I have amazing freedom! It’s sweet to hear others’ hearts and know it is a gift to listen. It’s wonderful to know I can bless someone with my time, attention, and resources. I can be more free to bless more often when I’m emotionally available, rather than trapped in a depressing cycle of last week’s lows competing with this week’s drama (whether others’ or mine!). The point is, being in the moment is one of the ways I can be available to the people around me in a genuinely helpful way. 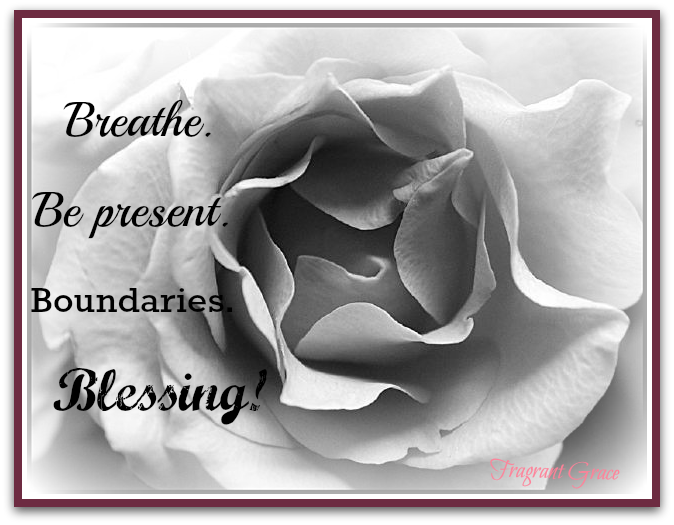 Wherever I am, I need to breathe, be with, be appropriate, and then bless. I think that’s practical and wise, and I think it’s how the Church really is the people of God. Then people don’t get lost in the process; the process serves the people. I want to “get” this! I think freedom from the heavy weight in relationship is in this somewhere. Does this strike a chord with anyone? Invitation to the Jesus Life by Jan Johnson was helpful in understanding the “with” factor in relationship to God and others. I recommend it. I have had to work on boundaries in relationships, too, so it really hit home. Sometimes I feel guilty or selfish, but I know that sometimes inaction is more loving. Great post!! You encourage me, Rene, thank you. Yes, yes, yes, being present is so important! Love the quote! Have I ever mentioned how blessed I am by some of the very first people I found on WordPress? 😉 Thanks! And the iron sharpening iron is perfect! You sharpen me every time. This article. Your heart to be a “doer” and not a “hearer only”. Your self-display of the work in progress that you are in Christ. As James shows -and most loudly proclaims – we are not to strive to be perfect. God is perfecting us. May He always have our hearts open as clay is ready. I’m sharing this. It is right where my heart has been in the past recent time about what friendship looks like. I’ve been hurt time and again because I give these things and rarely see it in return. It is hurtful. I have a blog post all about this I’m writing… particularly timely in my life because of recent experiences. In those God has shown me that I was expecting too much of those who don’t want to try. So glad I’ve met some awesome “try-ers and doers” here on the blogosphere. Like you!! Thank you so much, Heather! I’m so grateful you stopped by, read, and then shared all of this. I enjoy reading others’ blogs so much (especially yours), and I’m humbled whenever something strikes a chord with someone else. I know exactly how you feel. Exactly. You bless me.